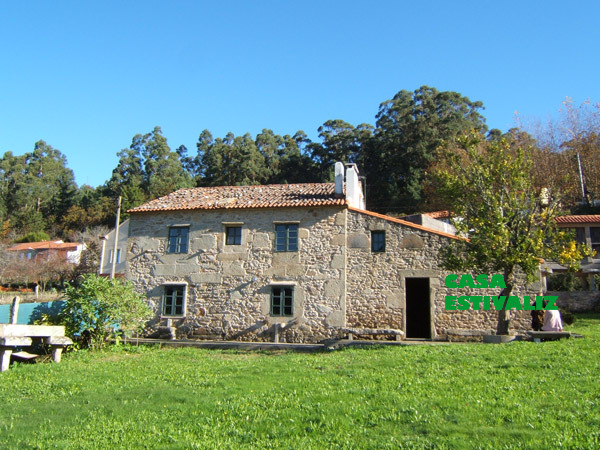 Detached traditional stone house (300 m2), with private large garden ( 1.000 m2) located in small rural town very close to a marvellous beach and the Ria de Muros-Noia and not far from the old city of Noia. The house is large, with a kitchen, full bathroom and living room in ground floor; five bedrooms and toilet in first floor, and another twin bedroom in third floor. Please note that even there are so many bedrooms, capacity is limited to 8 people for comfort reasons, but can be extended to 10 people if required. 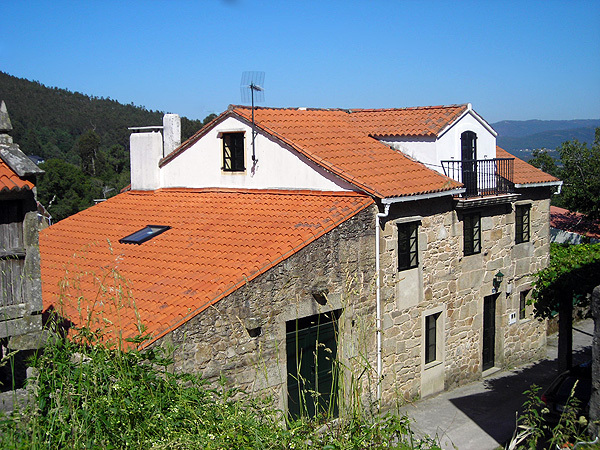 There is a large extension (60 m2), connected to the kitchen and the living room, which was a cider and wine cellar and now is used as a dinning-living area ( a couple of couches will be provided), and have an open fireplace which can be used as a barbecue, and a traditional stone oven, used in the old times to bake bread and roasts, ready to be used again!. Outside there is a private large garden, which gets the sun all day, with many trees, also fruit trees, and great views, and only a few houses around. A small portable pool, suitable for children, is available under request. There is also a traditional stone laundry place outside for large items of cloth although a washing machine is in the house for your comfort. The kitchen has a gas hob unit with oven and there is also a wood burner kitchen with a vitroceramic top for cooking. Microwave, fridge freezer and most utensils you may need are provided. Furniture is old stylish and simple, but comfortable and suitable for holidays in summer. It is a great place to enjoy holidays, quiet but close to everything, and surrounded by nature. Neighbours are rural people, great workers and good for a chat if you wish company. One of them is a famous painter. 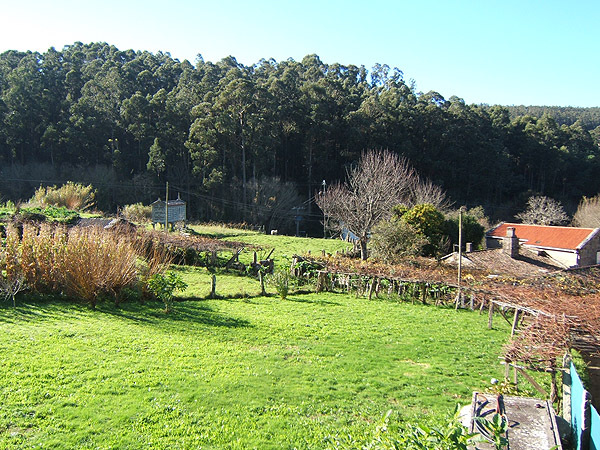 The old city of Noia is only at 8 Km and the nearest beach is just at 2 Km. View from street of North facing side of the house. Large plot of land at the back for private use. Peace and nature and just 2 Km from beautiful beach. View from back garden of South facing side. 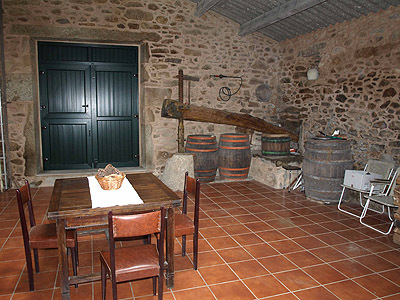 Extension which was a wine and cider cellar and now is used as a living-dinning area. 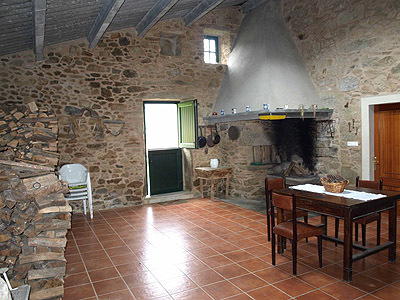 Other side of extension with open fire place (lareira) used as a barbecue, and traditional stone oven. Another picture from different angle. Living room furnished with old style typical furniture. Prices are per week for up to 6 people, in Euros. Extra charge for additional people (up to 10). Please inquire. There is a 40% booking deposit to be paid bay bank transfer.